This 2016 new body style RX 350 has had only one owner that took excellent care of his truck, even installing 3M film protection on the hood, a remote starter, and a TAG theft prevention system. Approximately $2000 of aftermerket accesories already on the vehicle. 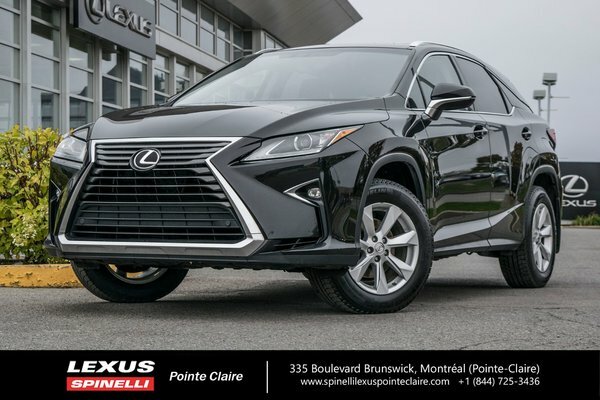 This beautiful luxury SUV was purchased new from Spinelli Lexus Pointe-Claire and has 63 100 kms on the odometer. Never accidented. Carproof vehicle history report and LEXUS Canada maintenance history report are available. This RX 350 warranty also protects it until April 27, 2022 or 110 000 kms. On the spot financing is also available. This very clean RX 350 is superbly equipped with 18'' alloy wheels, leather interior, heated and ventilated front seats, heated steering wheel, heated rear seats, power tilt and telescopic steering wheel, power sunroof, back up camera, memory driver's seat, and much more. Fully reconditionned to Spinelli Lexus Pointe-Claire standards. This RX 350 has brand new brakes (pads and rotors) at all 4 wheels, brand new Michelin Lattitude X Ice X12 winter tires, fresh oil and filters, wheel alignment, and full tank of gas. Don't miss out on this turn key opportunity!